Now, we’re planning another move, this time 2,000 miles away. Unlike our last, local move, this time I’m decluttering in earnest because the last thing I want is to pay good money to haul stuff I don’t need half way across the country. Where Does the Clutter Come From? 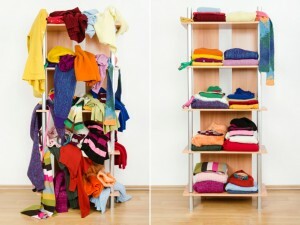 While we’re decluttering, we’re learning a lot about where the clutter comes from. My hope is that understanding this will help stymie the growth of clutter in our new house. My husband and I aren’t constant consumers. We’re fairly frugal and try to limit our expenditures. However, I’ve decided that kids are big clutter creators. My 5 year old loves art, and she is always creating drawings, cards, and pictures. I enjoy these but believe in rotating them out (i.e. throwing them in the garbage) as she makes new creations. I put a bag full of her creations to go out to recycling, and my husband intercepted them because he couldn’t handle throwing out her work. Another source of clutter with kids is gifts that well-meaning friends and relatives give. My husband and I both want our kids to be creative and to use their imaginations. We want toys, especially toys that aren’t multi-purpose, to be kept to a minimum. I’d much prefer that the kids have a stack of blocks to create with or a doll rather than a pretend vacuum, for instance. However, most of the gifts that they get are only one purpose gifts. While I appreciate the thought, those toys don’t get used often, and I feel bad donating them or giving them away. Of course, the kids aren’t the only ones to be blamed. I have a soft spot for good sales, whether they be at the local retail store (I bought way too many Gymboree shirts for my daughter when they were on sale for $3.99) or at a garage sale. If something is cheap at a garage sale, I may buy it even if I’m not sure that I’ll use it. After all, it’s so cheap. What do I have to lose? If I want our new home to be clutter free, I’ll need to rein in this impulse. What amazed me most while decluttering and packing up for our move is how much stuff I had all around my house that I never use anymore. For instance, my daughter became strongly intolerant to corn about a year ago, so we don’t eat any corn products any more. Still, my pantry had corn starch and corn syrup that I hadn’t used in over a year. Why hadn’t I thrown that away earlier? My husband and I bought a juicer a few years ago, but we didn’t like using it. I’ve been meaning to try to sell it, but I just never got around to it before. Likewise, our youngest child is 4 years old and has been out of a crib for 1.5 years, but the crib was down in the basement gathering dust. There is absolutely no reason to hang on to this crib; our family is complete, and it’s not like my daughter will go back in the crib. Once we move, my plan is to go through our new house once a year from top to bottom and get rid of anything that is no longer relevant to our lives and that we don’t use. Hopefully, that way we can keep our clutter at bay and enjoy the just-moved-in-enjoy-the-decluttered-house feeling year after year. How do you keep clutter at bay, or does it slowly creep in as ours did? Love the plan of attack! Most of ours comes from papers we never seem to have time to plow through. But the kids toys certainly don’t help matters. My husband is a pack rat and keeps stuff that is broken and plans to fix but never has time for. I am getting on the declutter bandwagon and pulling him reluctantly along!